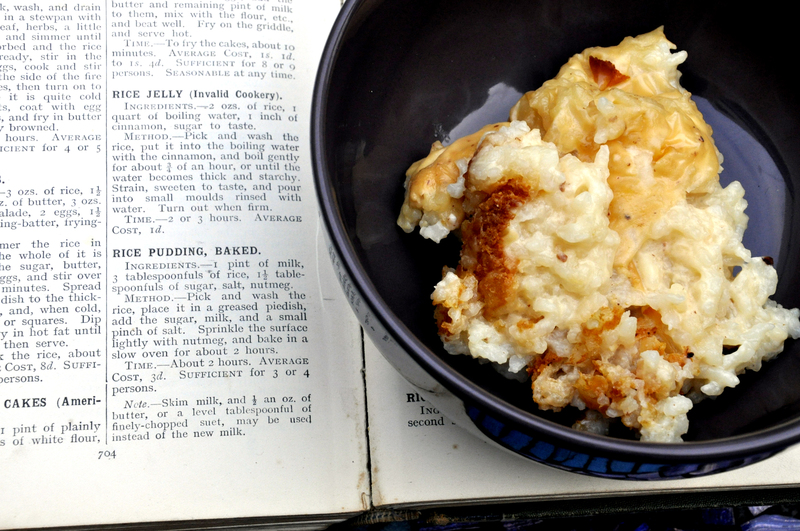 This is an economical and easy old recipe from the 1907 edition of Mrs Beeton’s Family Cookery that belonged to my Grandma. As mentioned in a previous ramble about puddings, my Mum made this for dinner most Saturday nights, especially when she made a roast dinner. I guess it’s baked rice porridge. As a kid I loved it with a little cold milk poured over the top to cool it quickly, as I was too impatient to wait. I still love it, at its best accompanied by tart fruit compote, such as rhubarb or plums. I use short grained rice, Arborio works well, skimmed milk without the added extra fat, scant measures of sugar as the pudding tends to be very sweet, and freshly grated nutmeg. METHOD.- Pick and wash the rice, place it in a greased pie dish, add the sugar, milk and a small pinch of salt. Sprinkle the surface lightly with nutmeg, and bake in a slow oven for about 2 hours. SUFFICIENT for 3 or 4 persons. It simple, cheap and my ultimate comfort food, give it a whirl! This entry was posted on May 15, 2012 by ladyredspecs in Desserts, FODMAP diet, Food, Gluten Free, Light dessert, Warm Puddings and tagged cheap, dessert, easy, rice, sweets.